In ancient Greek lore, the Titans were giant deities of incredible strength who ruled during the legendary Golden Age and gave birth to the Olympian gods we all know and love. Saturn's largest moon, known as Titan, is therefore appropriately named. In addition to being Saturn's largest moon – and the second-largest moon in the solar system (after Jupiter's moon Ganymede) – it is larger by volume than even the smallest planet, Mercury. Titan was discovered on March 25th, 1655, by the Dutch astronomer Christiaan Huygens. Huygens had been inspired by Galileo's improvements in telescopes and his discovery of moons circling Jupiter in 1610. By 1650, he went about developing a telescope of his own with the help of his brother (Constantijn Huygens, Jr.) and observed the first moon of Saturn. In 1655, Huygens named it Saturni Luna (Latin for "Saturn's moon") in a tract De Saturni Luna Observatio Nova ("A New Observation of Saturn's Moon"). As Giovanni Domenico Cassini discoveries four more moons around Saturn between 1673 and 1686, astronomers began to refer to them as Saturn I through V (with Titan being in the fourth position as Saturn IV). After William Herschel's discovery of Mimas and Enceladus in 1789, which are closer to Saturn than any of the larger moons, Saturn's moons once again had to be re-designated. Thenceforth, Titan status became fixed as Saturn VI, despite the discovery of several smaller moons that were closer to Saturn since then. The name Titan, along with the names for all the seven major satellites of Saturn, were suggested by William Herschel's son, John. In 1847, John Herschel published Results of Astronomical Observations Made at the Cape of Good Hope, in which he suggested that the moons be named after the mythological Titans – the brothers and sisters of Cronus, who is the Greek equivalent to Saturn. With a mean radius of 2576 ± 2 km and a mass of 1.345 × 1023 kg, Titan is 0.404 the size of Earth (or 1.480 Moons) and 0.0225 times as massive (1.829 Moons). Its orbit has a minor eccentricity of 0.0288, and its orbital plane is inclined 0.348 degrees relative to Saturn's equator. It's average distance from Saturn (semi-major axis) is 1,221,870 km – ranging from 1,186,680 km at periapsis (closest) to 1,257,060 km at apoapsis (farthest). Though similar in composition to Dione and Enceladus, Titan is denser due to gravitational compression. In terms of diameter and mass (and hence density) Titan is more similar to the Jovian moons of Ganymede and Callisto. Based on its bulk density of 1.88 g/cm3, Titan's composition is believed to consist half of water ice and half of rocky material. It's internal makeup is likely differentiated into several layers, with a 3,400-kilometre (2,100 mi) rocky center surrounded by layers composed of different forms of crystalized ice. 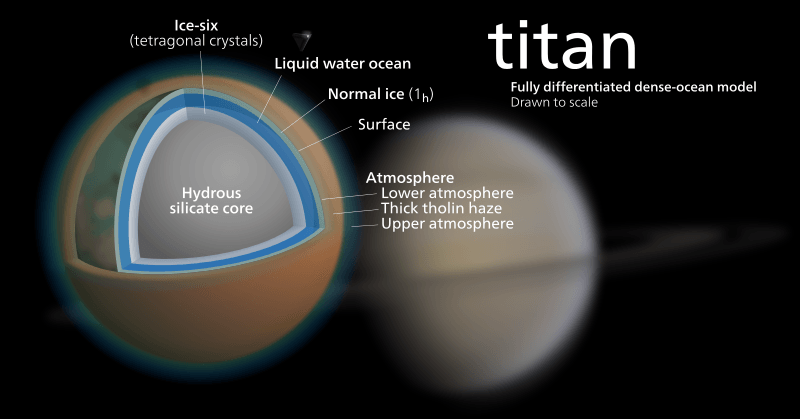 Based on evidence provided by the Cassini-Huygens mission in 2005, it is believed that Titan may also have a subsurface ocean which exists between the crust and several deeper layers of high-pressure ice. This subsurface ocean is believed to be made up of water and ammonia, which allows the water to remain in a liquid state even at temperatures as low as 176 K (-97 °C). Evidence of a systematic shift of the moon's surface features (which took place between October 2005 and May 2007) suggests that the crust is decoupled from the interior – possibly by a liquid layer in between – as well as the way the gravity field varies as Titan orbits Saturn. This is believed to due to geological processes which have reshaped Titan's surface over time. For example, a range measuring 150 km (93 mi) long, 30 km (19 mi) wide, and 1.5 km (0.93 mi) tall has been potted in the southern hemisphere, composed of icy material and covered in methane snow. The movement of tectonic plates, perhaps influenced by a nearby impact basin, could have opened a gap through which the mountain's material upwelled. Then there is Sotra Patera, a chain of mountains that is 1000 to 1500 m (0.62 and 0.93 mi) in height, has some peaks topped by craters, and what appears to be frozen lava flows at its base. If volcanism on Titan really exists, the hypothesis is that it is driven by energy released from the decay of radioactive elements within the mantle, tidal flexing caused by Saturn's influence, or possibly the interaction of Titan's subsurface ice layers. An alternate theory is that Titan is a geologically dead world and that the surface is shaped by a combination of impact cratering, flowing-liquid and wind-driven erosion, mass wasting and other externally-motivated processes. According to this hypothesis, methane is not emitted by volcanoes but slowly diffuses out of Titan's cold and stiff interior. 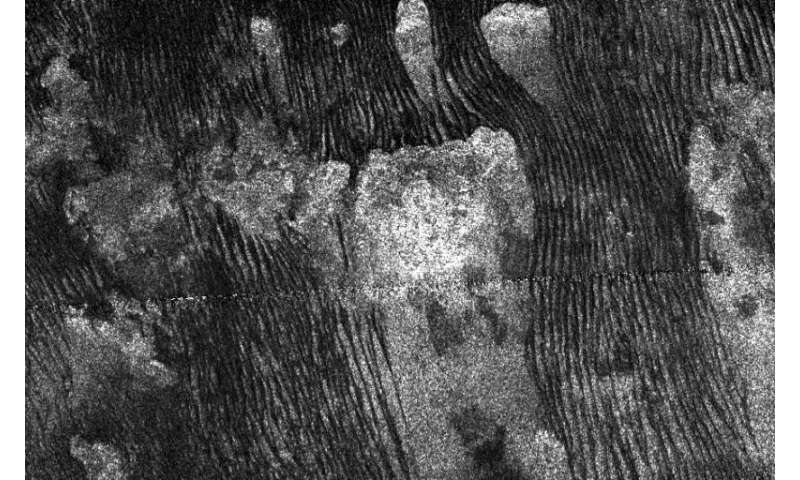 The few impact craters discovered on Titan's surface include a 440 km (270 mi) wide two-ring impact basin named Menrva, which is identifiable from its bright-dark concentric pattern. A smaller, 60 km (37 mi) wide, flat-floored crater named Sinlap and a 30 km (19 mi) crater with a central peak and dark floor named Ksa have also been observed. Radar and orbital imaging has also revealed a number of "crateriforms" on the surface, circular features that may be impact related. These include a 90 km (56 mi) wide ring of bright, rough material known as Guabonito, which is thought to be an impact crater filled in by dark, windblown sediment. Several other similar features have been observed in the dark Shangri-la and Aaru regions. The presence of cryovolcanism has also been theorized based on the fact that there is apparently not enough liquid methane on Titan's surface (see below) to account for the atmospheric methane. However, to date, the only indications of cryovolcanism are particularly bright and dark features on the surface and 200 m (660 ft) structures resembling lava flows that were spotted in the region called Hotei Arcus. Titan's surface is also permeated by streaky features (aka. "sand dunes"), some of which are hundreds of kilometers in length and several meters high. These appear to be caused by powerful, alternating winds that are caused by the interaction of the sun and Titan's dense atmosphere. Titan's surface is also marked by broad regions of bright and dark terrain. 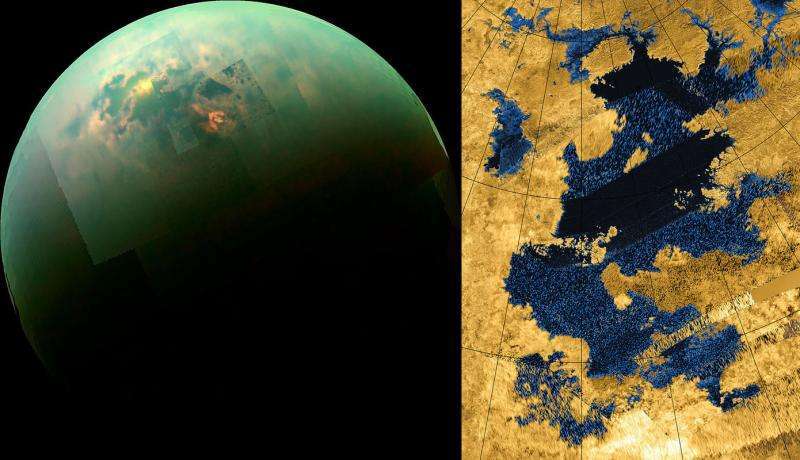 Titan is also home to its famous "hydrocarbon seas", lakes of liquid methane and other hydrocarbon compounds. Many of these have been spotted near the polar regions, such as Ontario Lacus. This confirmed methane lake near the south pole has a surface area of 15,000 km2 (making it 20% smaller than its namesake, Lake Ontario) and a maximum depth of 7 meters (23 feet). But the largest body of liquid is Kraken Mare, a methane lake near the north pole. With a surface area of about 400,000 km2, it is larger than the Caspian Sea and is estimated to be 160 meters deep. Shallow capillary waves (aka. ripple waves) that are 1.5 centimeters high and moving at speeds of 0.7 meters per second have also been detected. 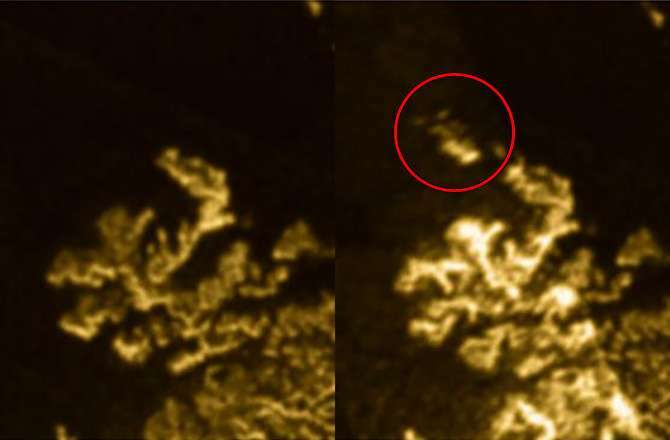 Then there is Ligeia Mare, the second largest known body of liquid on Titan, which is connected to Kraken Mare and also located near the north pole. With a surface area of about 126,000 km2 and a shoreline that is over 2000 km (1240 mi) in length, it is larger than Lake Superior. Much like Kraken Mare, it takes its name from Greek mythology; in this case, after one of the sirens. It was here that NASA first noticed a bright object measuring 260 km2 (100 square miles), which they named "Magic Island". This object was first spotted in July 2013, then disappeared later, only to reappear again (slightly changed) in August 2014 . It is believed to be inked to Titan's changing seasons, and suggestions as to what it might be range from surface waves and rising bubbles to floating solids suspended beneath the surface. Although most of the lakes are concentrated near the poles (where low levels of sunlight prevent evaporation), a number of hydrocarbon lakes have also been discovered in the equatorial desert regions. This includes one near the Huygens landing site in the Shangri-la region, which is about half the size of Utah's Great Salt Lake. Like desert oases on Earth, it is speculated that these equatorial lakes are fed by underground aquifers. Titan is the only moon in the solar system with a significant atmosphere, and the only body other than Earth who's atmosphere is nitrogen-rich. Recent observations have shown that Titan's atmosphere is denser than Earth's, with a surface pressure of about 1.469 KPa – 1.45 times that of Earths. It is also about 1.19 times as massive as Earth's atmosphere overall, or about 7.3 times more massive on a per-surface-area basis. The atmosphere is made up of opaque haze layers and other sources that block most visible light from the sun and obscure its surface features (similar to Venus). Titan's lower gravity also means that its atmosphere is far more extended than Earth's. In the stratosphere, the atmospheric composition is 98.4% nitrogen with the remaining 1.6% composed mostly of methane (1.4%) and hydrogen (0.1–0.2%). There are trace amounts of other hydrocarbons, such as ethane, diacetylene, methylacetylene, acetylene and propane; as well as other gases such as cyanoacetylene, hydrogen cyanide, carbon dioxide, carbon monoxide, cyanogen, argon and helium. 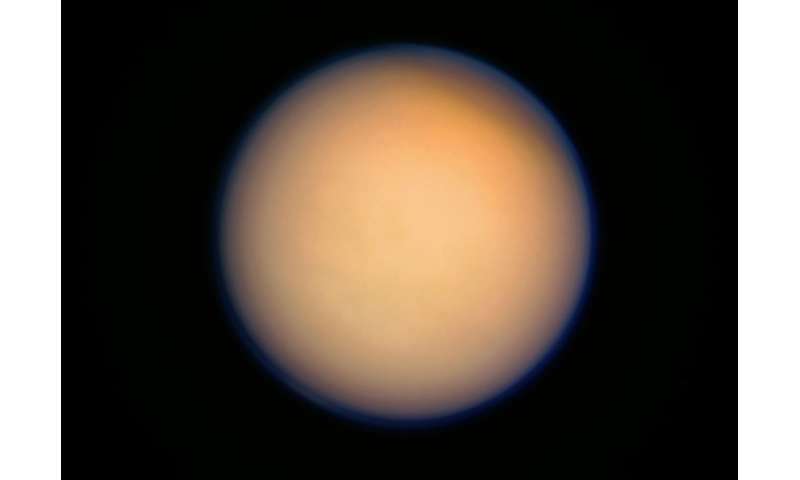 The hydrocarbons are thought to form in Titan's upper atmosphere in reactions resulting from the breakup of methane by the sun's ultraviolet light, producing a thick orange smog. Energy from the sun should have converted all traces of methane in Titan's atmosphere into more complex hydrocarbons within 50 million years—a short time compared to the age of the solar system. This suggests that methane must be replenished by a reservoir on or within Titan itself. The ultimate origin of the methane in its atmosphere may be its interior, released via eruptions from cryovolcanoes. Titan's surface temperature is about 94 K (-179.2 °C), which is due to the fact that Titan receives about 1% as much sunlight as Earth. At this temperature, water ice has an extremely low vapor pressure, so the little water vapor present appears limited to the stratosphere. The moon would be much colder, were it not for the fact that the atmospheric methane creates a greenhouse effect on Titan's surface. Conversely, haze in Titan's atmosphere contributes to an anti-greenhouse effect by reflecting sunlight back into space, cancelling a portion of the greenhouse effect and making its surface significantly colder than its upper atmosphere. In addition, Titan's atmosphere periodically rains liquid methane and other organic compounds onto its surface. Based on studies simulating the atmosphere of Titan, NASA scientists have speculated that complex organic molecules could arise on Titan (see below). In addition, propene – aka. propylene, a class of hydrocarbon – has also been detected in Titan's atmosphere. This is the first time propene has been found on any moon or planet other than Earth, and is thought to be formed from recombined radicals created by the UV photolysis of methane. Titan is thought to be a prebiotic environment rich in complex organic chemistry with a possible subsurface liquid ocean serving as a biotic environment. Ongoing research of Titan's atmosphere has led many scientists to theorize that conditions there are similar to what existed on a primordial Earth, with the important exception of a lack of water vapor. Numerous experiments have shown that an atmosphere similar to that of Titan, with the addition of UV radiation, could give rise to complex molecules and polymer substances like tholins. In addition, independent research conducted by the University of Arizona reported that when energy was applied to a combination of gases like those found in Titan's atmosphere, many organic compounds were produced. These includes the five nucleotide bases – the building blocks of DNA and RNA – as well as amino acids, which are the building blocks of protein. Multiple laboratory simulations have been conducted that have led to the suggestion that enough organic material exists on Titan to start a chemical evolution process analogous to what is thought to have started life here on Earth. While this theory assumes the presence of water that would remain in a liquid state for longer periods that have been observed, organic life could theoretically survive in Titan's hypothetical subsurface ocean. It has also been suggested that life could exist in Titan's lakes of liquid methane, just as organisms on Earth live in water. Such organisms would inhale dihydrogen (H²) in place of oxygen gas (O²), metabolize it with acetylene instead of glucose, and then exhale methane instead of carbon dioxide. 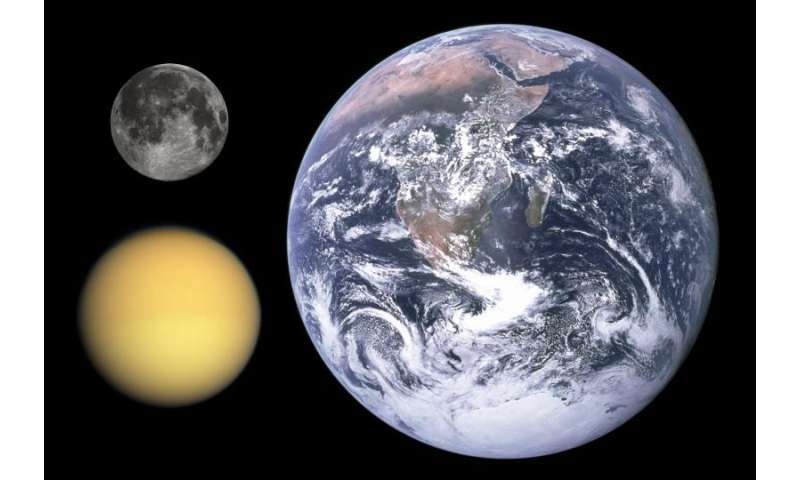 Although all living things on Earth use liquid water as a solvent, it is speculated that life on Titan could actually live in liquid hydrocarbons. Several experiments and models have been constructed to test this hypothesis. For instance, atmospheric models have shown that molecular hydrogen is in greater abundance in the upper atmosphere and disappears near the surface – which is consistent with the possibility of methanogenic life-forms. Another study has shown that there are low levels of acetylene on Titan's surface, which is also in line with the hypothesis of organisms consuming hydrocarbons. In 2015, a team of chemical engineers at Cornell University went as far as to construct a hypothetical cell membrane that was capable of functioning in liquid methane under conditions similar to that on Titan. Composed of small molecules containing carbon, hydrogen, and nitrogen, this cell was said to have the same stability and flexibility as cell membranes on Earth. This hypothetical cell membrane was termed an "azotosome" (a combination of "azote", French for nitrogen, and "liposome"). Also, life on Titan would face tremendous obstacles compared to life on Earth – thus making any analogy to Earth problematic. For one, Titan is too far from the sun, and its atmosphere lacks carbon monoxide (CO), which results in it not retaining enough heat or energy to trigger biological processes. Also, water only exists on Titan's surface in solid form. So while the prebiotic conditions that are associated with organic chemistry exist on Titan, life itself may not. However, the existence of these conditions remains a subject of fascination among scientists. And since its atmosphere is thought to be analogous to Earth's in the distant past, researching Titan could help advance our understanding of the early history of the terrestrial biosphere. Titan cannot be spotted without the help of instrumentation, and is often difficult for amateur astronomers because of interference from Saturn's brilliant globe and ring system. And even after the development of high-powered telescopes, Titan's dense, hazy, atmosphere made observations of the surface very difficult. Hence, observations of both Titan and its surface features prior to the space age were limited. This included readings on Titan's density, composition, and temperature of the atmosphere, and obtain a precise measurement of Titan's mass. Atmospheric haze prevented direct imaging of the surface; though in 2004, intensive digital processing of images taken through Voyager 1's orange filter did reveal hints of the light and dark features now known as Xanadu and Shangri-la. Even so, much of the mystery surrounding Titan would not begin to be dispelled until the Cassini-Huygens mission – a joint project between NASA and the European Space Agency (ESA) named in honor of the astronomers who made the greatest discoveries involving Saturn's moons. The spacecraft reached Saturn on July 1st, 2004, and began the process of mapping Titan's surface by radar. The Cassini probe flew by Titan on October 26th, 2004, and took the highest-resolution images ever of Titan's surface, discerning patches of light and dark that were otherwise invisible to the human eye. 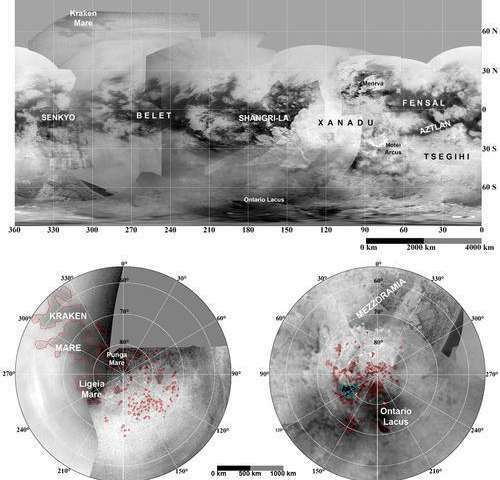 Over the course of many close flybys of Titan, Cassini managed to detect abundant sources of liquid on the surface in the north polar region, in the form of many lakes and seas. After landing just off the easternmost tip of the bright region now called Adiri, the probe photographed pale hills with dark "rivers" running down to a dark plain. The current theory is that these hills (aka. "highlands") are composed mainly of water ice, and that dark organic compounds – created in the upper atmosphere – may come down from Titan's atmosphere with methane rain and become deposited on the plains over time. Huygens also obtained photographs of a dark plain covered in small rocks and pebbles (composed of water ice) that showed evidence of erosion and/or fluvial activity. The surface is darker than originally expected, consisting of a mixture of water and hydrocarbon ice. The "soil" visible in the images is interpreted to be precipitation from the hydrocarbon haze above. Several proposals for returning a robotic space probe to Titan have been made in recent years. These include the Titan Saturn System Mission (TSSM) – a joint NASA/ESA proposal for the exploration of Saturn's moons – that envisions a hot-air balloon floating in Titan's atmosphere and conducting research for a period of six months. There was also a proposal known as Titan Mare Explorer (TiME), a concept under consideration by NASA in conjunction with Lockheed Martin. This mission would involve a low-cost lander splashing down in a lake in Titan's northern hemisphere and floating on the surface of the lake for 3 to 6 months. However, NASA announced in 2012 that it favored the lower-cost InSight Mars lander instead, which is scheduled to be sent to Mars in 2016. Another mission to Titan was proposed in early 2012 by Jason Barnes, a scientist at the University of Idaho. Known as the Aerial Vehicle for In-situ and Airborne Titan Reconnaissance (AVIATR), this unmanned plane (or drone) would fly through Titan's atmosphere and take high-definition images of the surface. NASA did not approve the requested $715 million at the time and the future of the project is uncertain. In response to NASA's 2010 Discovery Announcement, the concept known as Journey to Enceladus and Titan (JET) was proposed. Developed by Caltech and JPL, this mission would consist of a low-cost astrobiology orbiter that would be sent to the Saturnian system to asses the habitability potential of Enceladus and Titan. In 2015, NASA's Innovative Advanced Concepts (NIAC) awarded a Phase II grant to a proposed robotic submarine in order to further investigate and develop the concept. This submarine explorer, should it be deployed to Titan, will explore the depths of Kraken Mare to investigate its makeup and potential for supporting life. The colonization of the Saturn system presents numerous advantages compared to other gas giants in the solar system. According to Dr. Robert Zubrin – an American aerospace engineer, author, and an advocate for the exploration Mars – these include its relative proximity to Earth, its low radiation, and its excellent system of moons. Zubrin has also stated that Titan is the most important of these moons when it comes to building a base to develop the system's resources. The thick atmosphere also makes radiation a non-issue, unlike with other planets or Jupiter's moons. And while Titan's atmosphere does contain flammable compounds, these only present a danger if they are mixed with sufficient enough oxygen – otherwise, combustion cannot be achieved or sustained. Finally, the very high ratio of atmospheric density to surface gravity also greatly reduces the wingspan needed for aircraft to maintain lift. Titan is a moon that is shrouded in mystery, both literally and metaphorically. Until very recently, we were unable to discern what secrets it held because its atmosphere was simply too thick to see beneath. However, in recent years, we have managed to pull back that shroud and get a better look at the moon's surface. But in many ways, doing this has only confounded the sense of mystery surrounding this world. if a oxygen rich meteor/asteroid crashed through atmosphere could it ignite some of the hydrocarbons and leave behind water - like car engines produce water in exhust on cold morning?